Spring is a great time to clean up your home—and your energy bills. In many households, that means loads of laundry. 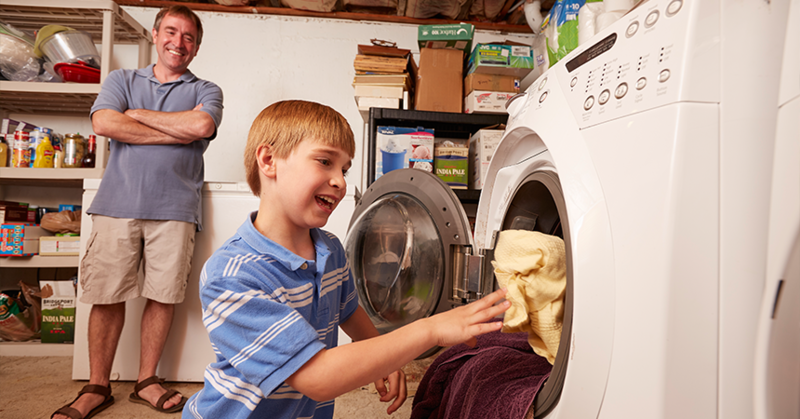 According to ENERGY STAR®, clothes washers more than 10 years old can cost up to $180 a year in water and energy costs. If you’re in the market for a new clothes washer, look for the ENERGY STAR label to use 25 percent less energy than standard washers. ENERGY STAR certified clothes washers are available in a variety of sizes, including stackable and small-space units. They also extract more water from clothes during the spin cycle, reducing the amount of drying time necessary—saving energy and wear and tear on your clothes. Even better: Energy Trust provides a $75 cash incentive for qualified clothes washers. When you’re ready to ditch your old washer, Energy Trust will recycle each unit responsibly, handle all the heavy lifting with free in-home pickup and give you $30 for each qualifying appliance you recycle. What’s the most efficient way to dry your clothes? In fair weather, give your dryer the day off and hang your clothes outside to dry. If skies are gray, invest in an ENERGY STAR certified clothes dryer or learn about what’s next in energy-efficient laundry: super-efficient heat pump clothes dryers. Northwest Energy Efficiency Alliance is working with manufacturers to bring super-efficient heat pump clothes dryers to market. Conventional clothes dryers use electricity or gas to generate heat, and then vent hot air out of the appliance. With potential to save 50 percent more energy than conventional electric dryers, a heat pump clothes dryer captures that hot air, removes the moisture from it, then reuses the already-hot air to dry more clothing.